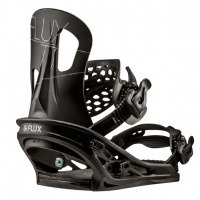 The FLUX TT does everything you need form a binding and can dominate the park just as easily as wade knee deep through pow or rip some carves on the piste. The Alpha highback offers all-round versatility with an even and natural flex and provides solid support from the super tough nylon material. A micro-adjuster lets you adjust the forward lean in 2.5° increments. The rigid Genetric base offers on-the-fly adjustment, a comfort footbed and all-condition versatility.